Meet Jyoti Amge, the smallest woman ever, according to Guinness World Book of Records, who has finally gotten married to the love of her life at the age of 23. 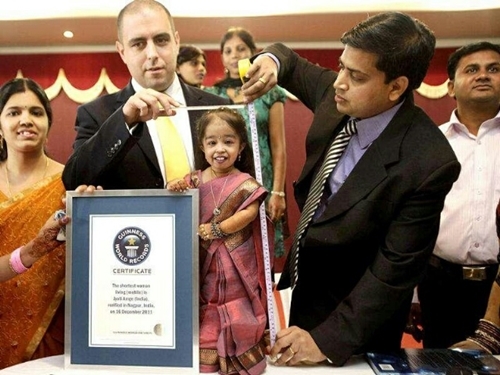 23-year old Indian woman identified as Jyoti Amge, has been awarded by Guinness World Records as the smallest living woman, a title which has been holding since 2012. 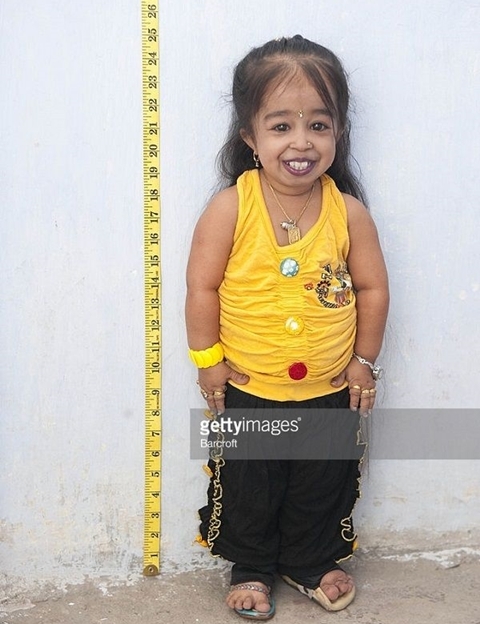 Born in December 16, 1993, Jyoti, has a height of 62.8 centimetres (2 ft 0.6 in) and from medical records, her restricted height is due to a growth abnormality called achondroplasia – which means she will never grow any taller than 2 ft 1 in (0.64 m). As the smallest woman in the world, it’s not all negative for Jyoti Amge; her status has also taken her to greater heights. She ended up living her dream of becoming a Hollywood actress when she was cast in the fourth season of American Horror Story: Freak Show as Ma Petite. While speaking of her life growing up in an interview, Jyoti said her new found fame has made her feel better and more important in the society. 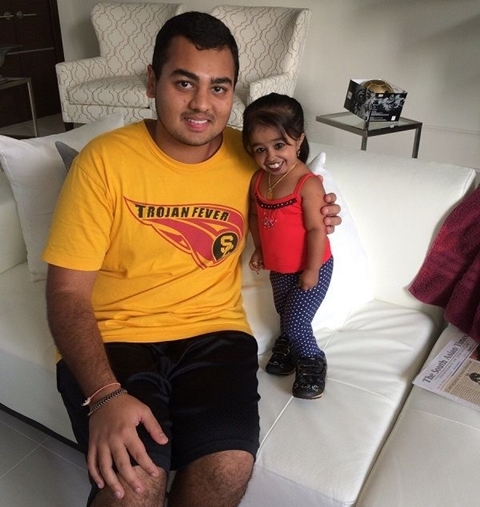 “I’m very happy to be the world’s smallest woman. Getting this record has made me feel better about myself. I feel popular, special and important. It was always my dream to come to London, to see Tower Bridge, the London Eye, and Madame Tussauds." Getting the attention of people is something Jyoti Amge has gotten used to all her life. Although it made uncomfortable at first, she said she finally learn to live and enjoy it. “In India, when I go around I hate the feeling of having a crowd around me, just standing there staring at me. They just come to look. It makes me feel uncomfortable. So sometimes I cover up my face with a scarf so people don’t recognise me. “I am proud of being small. I have the same thoughts and the same dreams as you. I would like to be an actress in Hollywood and win an Oscar. The only difference is my height. 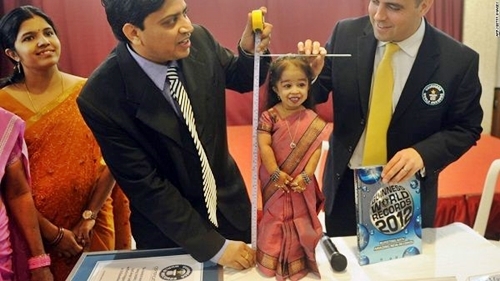 At 12lb, Jyoti Amge is only nine pounds heavier than when she was born. She talked about when she first realized she was smaller than other people early in life. Other than chatting on social media, playing video games and watching TV during her spare time, Jyoti Amge said she loves to hang out with her friends; who usually carry her since they’re much taller. As for romance, Jyoti insists that’s not an option for her. “I’m not looking for a boyfriend — but if I was, he’d have to be prepared to carry me around everywhere,” she said.